As part of my quest for Lion Knights’ castle, I have been mimicking 1980s LEGO Castle backgrounds in some of my own photography. 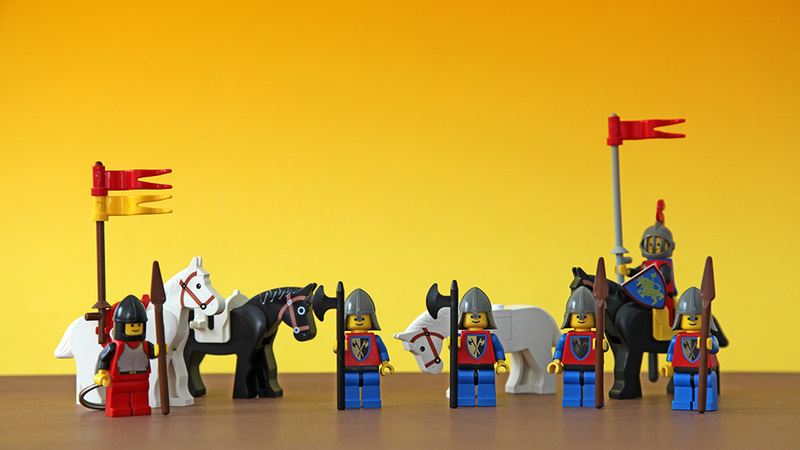 In a comment to the minifigures story, Filip asked how I made the background. I appreciate the feedback. Here’s how! Mind you, I wasn’t aiming for all the original 1980s details in my photos, simply for similar atmosphere and color. 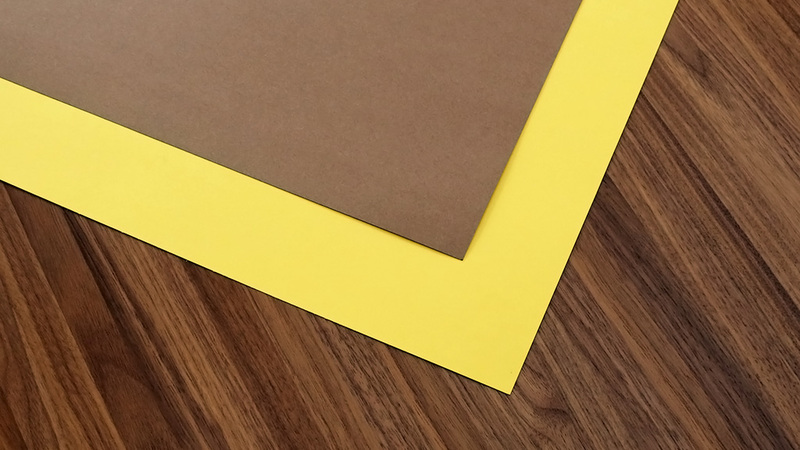 My imitation starts with two pieces of cardboard: yellow and brown, the kind you get from a craft store. The bigger the better, as a larger background makes the scene setup and framing easier. The two pieces of cardboard are then combined into one large piece by slightly overlapping one of their long edges and, using double-sided tape, connecting the cardboard pieces there (as evenly as possible). The connected piece will be the size of the two cardboards combined, minus the taped overlap. This will become the “studio backdrop”. 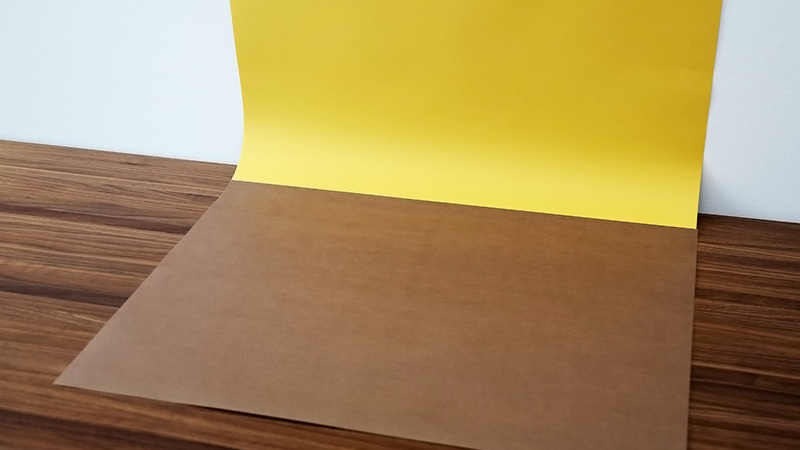 Next the cardboard is positioned on a flat surface, near a wall, so that the whole brown segment sits on the flat and the yellow segment gently bends upwards and attaches to the wall from the top with poster putty. The side with the brown cardboard topmost should be upwards, to hide the seam from the camera. It may also be necessary to place a piece or two of putty under the brown piece, to keep the structure in check. The photograph is fairly decent as it is, but I did add one step of post-processing for a little more authentic feel – the orange gradient from top down. Actual 1980s photography used much less pronounced gradients in the sky and a bottom-up “gradient” of orange hills instead, but without the hills and the sun my top-down gradient seems more fitting. One can use any suitable graphics editing program, I used Photoshop. Load the photograph, create a new layer for the gradient and set the pen (foreground color) to orange. Then select the Gradient Tool and set it to “foreground to transparent”, so that the gradient starts orange and then gradually blends into the photograph. Draw the gradient by swiping a third of the image from top middle down. Getting the gradient right requires some trial and error. Finally, adjust the blending of the gradient as needed. Because the gradient was drawn on a new layer instead of over the photograph, it can be adjusted after the fact via the Layers window by tuning the mode, opacity and fill of the gradient layer. I used Linear Burn with 99% opacity and 45% fill, but the exact values obviously depend on the photograph. P.S. My Lord of the Rings shots were done similarly, although with black cardboard. Thanks for the comment, Jojo! 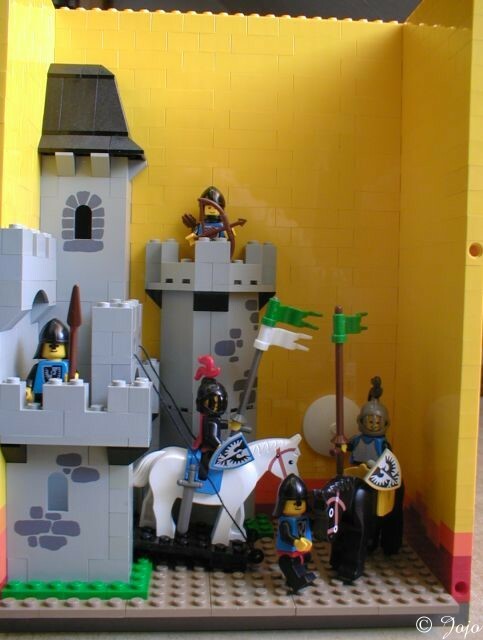 Very interesting use of actual LEGO bricks to re-create those 1980s backgrounds. Wonderful idea on your part, thank you for sharing.